i was trying to find a way for how to make aspnet identity integrate with my own database schema(to follow the DB team standards ) and i actually hit the wall hard , now finally they released the code of this library ! here https://github.com/aspnet/Identity/. Thanks Omar for your comment, I agree with you it was hard to integrate ASP.NET Identity with existing database. Omar this is actually pretty straightforward if you follow the code first approach as you can override the “OnModelCreating” function and then make customizations to the AspIdentity schema from there. This is excellent Taiseer. Keep up the great work. I can’t wait to see the complete end-to-end with the AngularJS UI. Are you planning to illustrate with a mini CRUD app? Any plans on when your series will be complete? Thanks again. Kind Regards. Walter. Hi Walter, well I’ll try to blog 2/3 posts per month, so maybe by the end of Feb , hopefully 🙂 Yes it will be simple membership system. This is great, thank you! I only wish the entire tutorial was complete. I’m just starting out on a new project and this was exactly the approach I was hoping to use. More, more, please! Next post will be on Monday, thanks and keep tuned. of accounts with a default password and want users to change to their own personalized credential when they first use the SPA. If not, what would be the best practice to add this functionality with ASPNET identity/OWIN. Thanks so much for your clear content inspirational blogs. They are a pleasure to go through.Just need the light bulb to go off on the above and I’ll feel in control for the first time 🙂 Mostly due to your blogs. Really happy to hear that posts are useful 🙂 I’m currently writing the part 2, and the use case you asked for is not covered yet, but I guess it can be added easily, let me think about it, and if I didn’t add it to the post we can take this offline later on. So Keep tuned! Thanks Taisser. Certainly will keep tuned. Can we consume that api from Android and iOS mobile applications too ? Absolutely, you can use this HTTP Service with any front-end client able to send HTTP requests. I ‘ve already integrated User Authentication from your articles. Looking forward to Role Based Authorization. These are really helpful articles. Very understandable , clear , easy and very useful. Salaam Taiseer, thank you for the post, I am learning all this websites stuff 🙂 – just so I am clear model factory acts similar to Auto mapper for mapping Model to DTOs? Thanks for your message, and yes you can use Auto Mapper instead of model factory, but I prefer this pattern which gives me more control over DTOs returned. Hi, I’m new to your blog and it seems to be that there are two series of posts about the same topic (Asp.net Identity with AngularJS). Could you please explain the differences between the series? Could I implement the solution in your first series or should I wait for this one to be finished? Thanks a lot in advance! Hi, yes you can depend on the first tutorial, this one I’m building shows the features of ASP.NET Identity and covers different types of Authorization such as Roles and Claims. Taiseer, the blog is very useful to me , I also wanted to know the difference between the first series and this one ? Both are token based and both use OWIN. Great to hear it is useful, this one focus more on Asp.Net Identity features and APIs. Please can you give example of Database first approch. 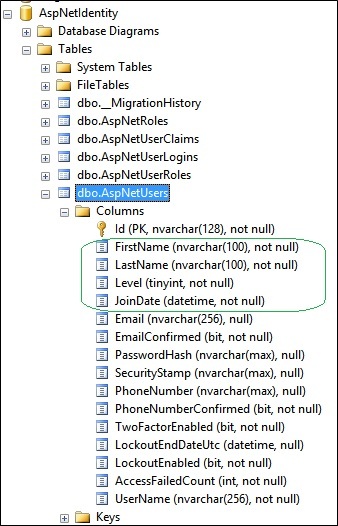 You mean adding Asp.Net Identity to existing database? You can check this post. I do not have something written for this usecase, still you can use Asp.Net Identity with existing database using Code First approach. Try changing “Request” to “HttpContext.Current”. Also note, that if you are using WebApi2.2, the location of the extension method “GetUserManager” has changed to: Microsoft.AspNet.Identity.Owin library. Hi! Great post. Unfortunately I’m facing the same issue with missing definition for GetOwinContext(). Would you have a solution for this? The source code repo has these in the following using statements. 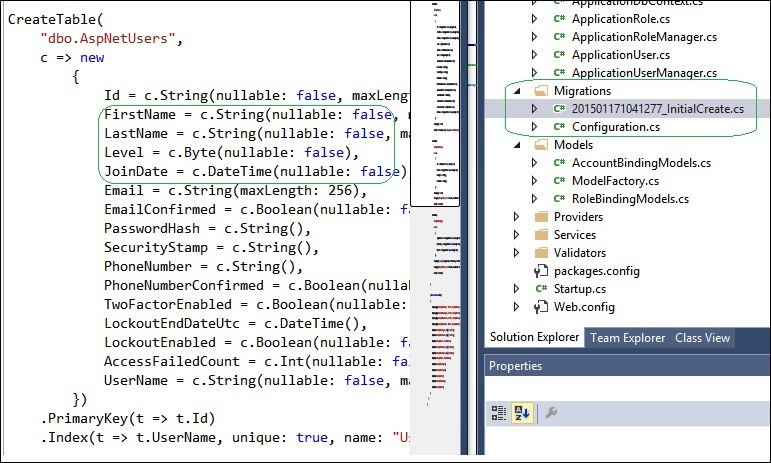 Hi, I’ve followed this post (using visual studio 2013) but cannot get the IIS express to find the controllers. I keep getting a 404 when I try to do a GET with postman. http://localhost:63486/api/accounts/users. I have configured application startup to be this project in my solution and I am running the web api application on http://localhost:63486. My code is identical to yours except that I’ve mapped my users db-table to another table than AspnetUsers. How should I be hosting owin in IIS, I guess following the steps mentioned above should be good enough or am I missing something? Hey, I had the same problem. You probably forgot to add [RoutePrefix(“api/accounts”)] attribute above the AccountsController. Can i use (LocalDb)\v 11.0 instead of default <add name="DefaultConnection" connectionString="Data Source=.\sqlexpress;Initial Catalog=AspNetIdentity; in web.config. I actually tried to change the data source to localdb but i dont know why database cant be created with this technique..Could you please help me on that? These posts are fantastic, as are the first series on this topic. In this particular one, my last test did not reveal that my power user had any claims, unlike the example. I tried yuor project but don’t work.. I replied you by email, please read the post carefully as all the steps implemented successfully and thousand of devs implemented it successfully. Dude your series simply rocks. I just follow the tutorial step by step, and in exactly 30″ I have a web api OWIN authentication server up and running. Amazing, great job, eager to read the next steps!! Glad it was easy to follow and implement, keep tuned, the next part is coming soon. Salaan Taiseer, I am trying to add some abstraction layer but a bit stuck would be able to answer a question http://stackoverflow.com/questions/29195043/null-base-unitofwork-entityframework-with-repository-pattern-usermanager ? Thanks for the great series of articles Taiseer. They are very informative reads. In the Seed() method, what is the benefit of creating a new ApplicationDbContext instead of using the one provided as a parameter? Wehn you test the GetUsers method via a HTTP GET, you get a response where SuperPowerUser has a couple of claims. How did the claims get in there? For the first question you are right, we can use the context in the parameter, I should fix this but it seems that I took this code from a unit test function I used to test the migration. Good catch in the the second point 🙂 I added them manually in the table to make sure that identity system is returning claims correctly, I’m currently working on next post which will cover claims in more depth. You can ignore those claims for now. Hello Taiseer, how are you? I would like to congratulate you on the magnificent work that you have done with Web API, Asp.NET Identity, Angularjs, etc. You are welcome, glad to know that posts are useful! Never mind, forgot to put header there. I have downloaded the supplied code (using visual studio 2013) but cannot get the IIS express to find the controllers. I keep getting a 404 when I try to contact the controller regardless of the api call I make (create or get users) with postman. I have looked as IIS express and can see it running. The only difference between the downloaded coded and what I am running is that I am using a different DB running under SQL Server. How do I go about debugging this? Hi Carig, apologies for the late reply. Well that is strange, the DB should do nothing with hitting the API endpoints. You still facing this issue or you were able to resolve it? Hi Taiseer – thanks for the reply as I know your busy with part 6. I was able to figure it out, the problem was with PostMan. I must have missed your blog on how to use the tool. Now i just need to know how to connect a Web Client to the API, especially dealing with logging in. As always, great posts on identity. I think I asked this already, but didn’t see the comment come up. 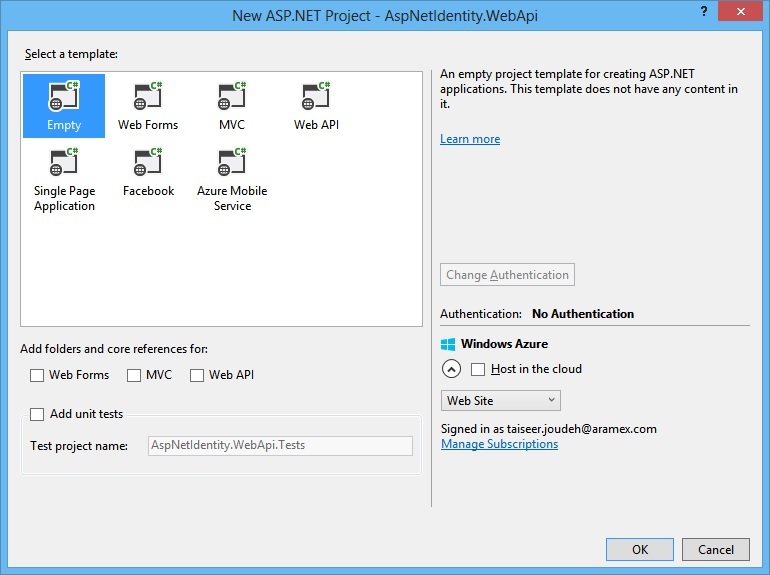 How is this implementation different from your previous series (June 2014) on implementing Identity with ASP.NET Web API? Just trying to understand what the differences are to see what’s best to use for my own project. Thanks! Hi Trevor, thanks for your comment. This part focus more on ASP.NET Identity features and using JWT instead of default access token format, I recommend you to use JWT but the other is the same. It’s an Internal Server Error (500). Make sure that the model for “Create User” has no null properties. You were right, the “CreateUser” funtion was called with a null property. i am also getting the same …. please help resolve>? I was getting this error too… then I realised that its a “POST” method. I needed something to post didn’t I! D’oh! Thanks for sharing this. Sure it will help! What about logging out a user? Would I use the RemoveLoginAsync and pass in the appropriate information? Never mind, I just realized RemoveLoginAsync is part of the UserManager and don’t want delete the user. I believe the best approach would be to have my Angular application clear out the token when the user logs out, correct? This is for removing social identity account link, and there is no way to remove/expire self contained access tokens. All you need to do is to clear it from your client application and leave the token until it expires. First of all thanks for this great tutorial, it’s very helpful, but I have a problem that I couldn’t resolve and maybe you can point me in the right direction. My problem is with the step 4, because my DB is already created, I mean, I have another architecture, and I would like to us that and not the one proposed or auto-generated by your suggested code. So, how could we adapt this to use our existing db structure and stored procedures? Is that possible? Well you need to take a look at how to add ASP.NET Idenety to existing DB, maybe this video help, but I never try it my self yet. Could you please provide sample code for “Log Out”? Just 1 question. Do I need to enable something in order to not allow or to throw an error when trying to create a user with an email address that already exists in the Db? Right now I am able to create user with same email address that already exists in the Db. Though, it doesn’t allow for same Username, without me enabling something. Thank you for sharing your brain to us. It’s already configured to require unique username and email. Thank you Taiseer. Yes, read it from Part 2. I guess default for Username is unique while Email is non-unique. Thumbs up! Hi. the code is working on my machine. however got this error message while querying against http://beewestwebapi2.azurewebsites.net/oauth/token. 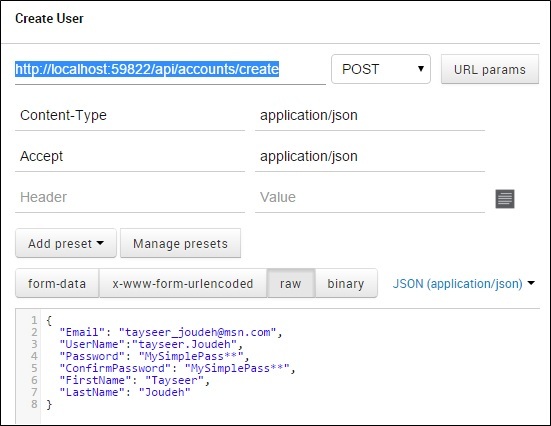 XMLHttpRequest cannot load http://beewestwebapi2.azurewebsites.net/oauth/token. No ‘Access-Control-Allow-Origin’ header is present on the requested resource. Origin ‘http://localhost:50453′ is therefore not allowed access. The response had HTTP status code 400. You didn’t configure CORS correctly so you can’t it from JS app, it should be working from PostMan, so try to read the article again and follow how I\m configuring CORS. How do I write the tests? This is an excellent article, very much appreciated. Awesome posts, Taiseer. I’m running into an issue that probably many others have had before me. On my windows 8.1 machine, I’ve installed Postman (now a standalone) and the interceptor (still in Chrome). Looked for your blog entry on using that but haven’t found it yet. I’m assuming I have to run the owin server before I can access the identity app with Postman. So to begin in VS I start the app using the Chrome client. What Chrome gets back is a 402.14 Forbidden response. The boilerplate solution provided is to go to the IIS Express directory and run appcmd. But when I use %systemroot%\system32\inetserv\appcmd in that directory windows says appcmd is not recognized as an internal or external command. Of course if I try to run it without the path it says the same thing. The error seems to be thrown in AccountController when it tries to create a new ApplicationUser. Not sure why it would do that _before_ a login screen was displayed. Any thought readers have would be appreciated. I’m not sure if I got your question correctly, PostMan is REST client like Fiddler where you can compose HTTP requests from, it is not related to Web API or Owin at all. You need run this project on IIS express or normal IIS and there is no UI at all for the API, once you deploy the application to IIS you start use PostMan, fiddler, etc.. to issue HTTP requests to the API and get results from it. Thanks for these sample solutions – these are helping a lot. I had a question on how to extend the ASP.NET Identity the right way for adding an organizational structure. 3) Extend the “Auth/Identity Server” to have Organizations/Groups in them. I’d be curious to hear thoughts on the above options. Great post and series in general. I found it very helpful. I’m interested in using ASP.NET Identity / WebApi from an Angular client. Any update on when you might have the final part of your series posted? There is a CORS exception when I try to sign up in the demo application http://ngauthenticationweb.azurewebsites.net/#/signup . This happens for me as well when I deploy Web Api to Azure . In local it works fine. Please help. I’m not facing any issue when I try to register from the demo website. Can you try again and let me know if there is issue happening. Hi Taiseer I have this issue only in my office network, that too across all browsers and all of my colleagues system. but doesn’t happen at home. Very strange (and confused),any guess? I wonder is _AppUserManager on BaseApiController have ever initialized? Or It just wait to be implement in future? Anyway thanks again for this nice tutorial series. I followed your tutorial a couple of times but still I get a 404 when I try to test requests. I see that the update-database command created the database without any errors and the seed method was called(I see the first user record in the database). However, I continuously see 404 and the application can’t find my api requests. I even tried by starting with a web api project. The api MVC routes work but not WebApi routes. Also the owin startup class is called as expected and I have decorated the correct RoutePrefix for class and Route attributes for the Web Api methods in the AccountController, but still no dice. I have tried to get the application to work both using Local IIS as well as IISExpress. So, I stopped in the debugger and found that “Request.GetOwinContext()” returns null. Hopefully, this is enough information for someone to lend a hand. I feel that you are mixing between Owin middleware and the traditional routes registration, that’s why your Web Api routes are not configured correctly and not being registered. Could you please just download the sample code and try to run it directly without adding MVC components, once you make sure that the Api is working correctly you can add Mvc NuGet packages. It is hard to tell where is the issue happening because there is lot of moving parts. Hi, what about OpenId? Can it be used with or in the place of ASP.NET Identity? Hi, when is “AngularJS Authentication and Authorization with ASP.NET Web API and Identity – Part 6” coming up? I just cant wait? Of course AllowAnonymous is correct, because the user still doesn’t exist in our database. But I am thinking that everyone can “call” this method infinite time in a loop destroying for instance our database. With cookie session we have more “protection” for these kind of attacks. Is there any best practice for prevent these situations? Even if you are using cookies not tokens, you will not have a cookie for anonymous users, so this scenario will happen too, you can think of using captcha or Api rate limiter to make sure that user is not sending for example more than 2 requests per 5 seconds. Thank you for your reply. Great article great work. Hi Taiseer, I would like to thank you for this great article! You have no idea how much you´ve helped me! I have followed it up to Part 5 and every thing works smoothly. I would just like to add a footnote for those starting: Turn off you firewall, because many of the problems that I read above seem to me to be related to it, as it happened to me. Thanks Carlos for your comment, always happy to help, and thanks for your note! hey.. really nice article. i followed ur tutorial. but wen i test it through fiddler m receiving an empty object in createUser method. Hi, make sure your request body is identical to mine, if not that’s why the serializer is not able to parse the request payload and cast it to CLR object. Would this still work with MVC6 and ASP.NET5? Now that WebAPI and MVC are merged, I’m wondering if any of this (great) series of article is still valid? If you attempt to create the user with a password that is too short or otherwise does not meet the minimum password requirements, then the Seed() method will silently fail to generate the user (even when using the -verbose flag on update-database). The simple solution is to ensure that your password is long enough. That is right, you have to set a password which meets the password policy defined in the ApplicationUserManager class. Thanks for sharing this. Looking forward to Part 6 ! hello I enjoy your article. It appears to be concise and exactly what I was searching for. However, I cannot simply execute ‘enable-migrations’ in PM Console. Figured it out. I mistakenly created a ‘web site’ and not a ‘web application’. I’m not sure what is this error is, did you try searching it on stack overflow? Excellent article. Is there any news on part 6? Can’t wait to get stuck in. Just one thing. Is it possible to use my custom database for users instead of this default one AspNetIdentity? 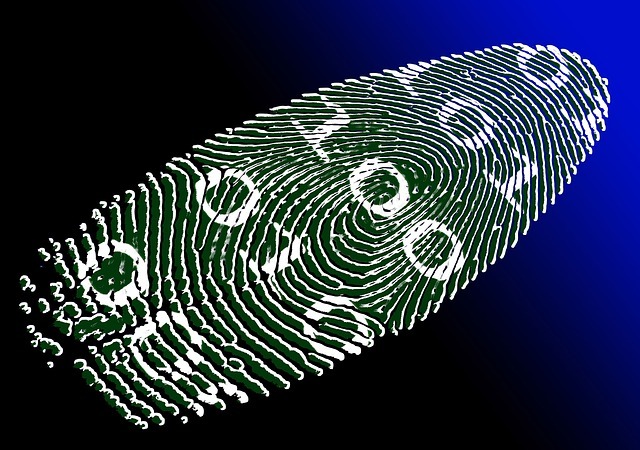 You can use any DB store you want, Identity system can be configured to use different stores, this post will help you for sure. Thanks. The only thing is that I use Microsoft SQL Server, but I guess approach is similar. Just one question. How hard is it to use users table in custom MsSQL database instead of this from default identity db? Are you looking to use ASP.NET Identity on top of MySql database or you want to use your own tables directly? I am looking to have users, roles and all authentication tables as a part of my database (running on the Microsoft SQL Server) alongside with other tables used in the app. An error occurred accessing the database. this usually means that the connection to the database failed. I Add the connection string exactly as u mentioned in the Web.Config file.. do you have any idea why iam getting this error?